‘The Final Project’ is a great title, capturing the unsettling combination of humour and honesty with which photographer Jo Spence (1934–1992), with her long-term collaborator Terry Dennett, documented her death from leukemia over two years in 1991–92. As a selection now being shown at London’s Richard Saltoun gallery demonstrates, the scope of the project was unflinching and ambitious – testament to an artist with nothing to lose. ‘The Final Project’ has a few different strands, which echo both the deterioration of Spence’s health and the stages of emotional trauma. An early part involved photographing comical assemblages in a graveyard, including joke-shop skeletons, flowers and bushy blond wigs, recalling the adage that sometimes the only response to tragedy one can muster is laughter. In another equally mischievous, though more analytical series, the feminist Spence contrasted Western obsessions with beauty and youth with the celebration of death in Mexican and Egyptian traditions. 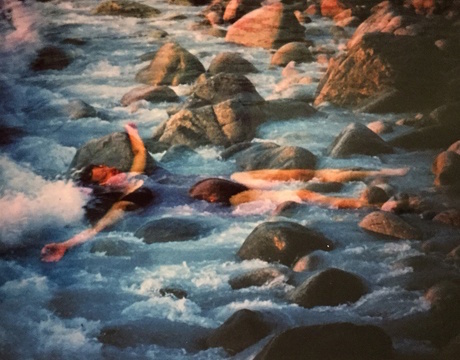 And finally, as she grew weaker, Spence fell back on the prodigious archive of images she had amassed during her career, and created new works by overlaying them in a technique called ‘slide-sandwiching’. These beautiful montages, with Spence’s body floating above a stream or a field, have a serene atmosphere of acceptance. Using older images of herself was also a way around what Spence called her ‘crisis of representation’, whereby she felt her emaciated body to be totally estranged from her spirit. Ultimately, though, she overcame this challenge as well. In a series of self-portraits from her deathbed, she manages with a peaceful stare to confound mortality itself.